Fig. 1-9. Upper Frasnian radiolarian complex with Bientactinosphaera egindyensis - Polyentactinia circumretia. Fig. 1-5, 7, 9 - Kazakhstan, North Mugodzhary, the Aitpaika River, sample B45/1-5 (from B.B.Nazarov's archive); fig. 6, 8 - China, Eastern and Southeastern Guangxi, Liukiang Formation (Li et Wang, 1991, pl. I, fig. 2, 7). Fig. 1. Polyentactinia circumretia Nazarov, GIN-№ 4046/95 (bar=60µm). Fig. 2. Bientactinosphaera aitpaiensis (Nazarov), GIN-№ 4046/106 (=150µm). Fig. 3. Bientactinosphaera egindyensis (Nazarov), GIN-№ 4046/98 (=43µm). Fig. 4. Astroentactinia crassata Nazarov, GIN-№ 4046/109 (=60µm). Fig. 5. Polyentactinia kossistekensis Nazarov, GIN-№ 4046/97 (=67µm). Fig. 6. Bientactinosphaera guangxiensis (Li et Wang), E-F-19 (=125µm). Fig. 7. Astroentactinia stellata Nazarov, GIN-№ 4046/119 (=67µm). Fig. 8. Cyclocarpus tubiformis Li et Wang, E-F-13 (=58µm). Fig. 9. Astroentactinia paronae (Hinde), GIN-№ 4046/111 (=100µm). Fig. 10-20. 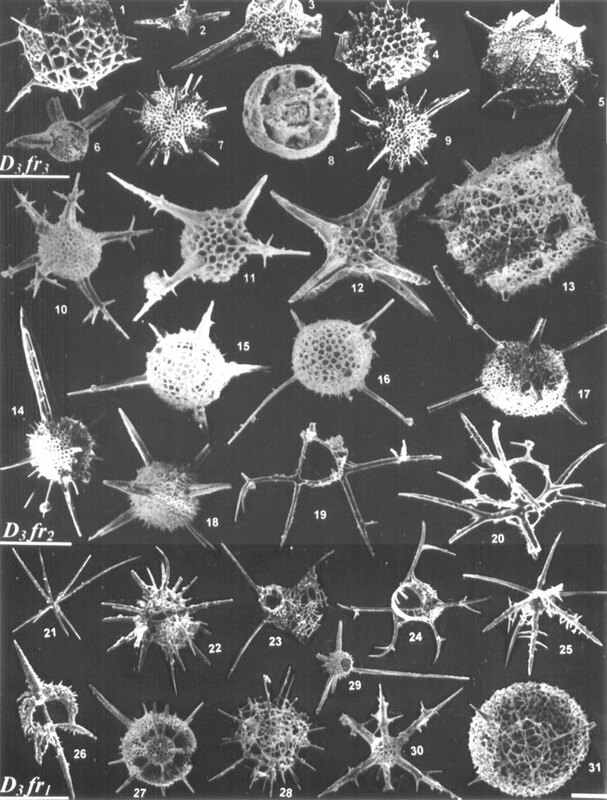 Middle Frasnian radiolarian complex with Moskovistella allbororum - Ceratoikiscum ukhtensis. Russia, Timan-Pechora Basin, borehole Shuda-Yag-1003: fig. 12, 14 - sample 68 (depth 73.0-73.3m); fig. 13 - sample 29 (depth 105.0-106.0m); fig. 17 - sample 8 (depth 120.9-124.0m); borehole Ukhtinskaya-3B: fig. 15 - sample 114 (depth 104.2-104.7m); the Lyajol River, outcrop 1904: fig. 10, 11, 16, 19, 20 - sample 6; the Ukhta River, sampling site no. 4: fig. 18 - sample 29. Fig. 10. Moskovistella allbororum Afanasieva, FF-P001/033-09512 (=56µm). Fig. 11. Moskovistella victorialis Afanasieva, FF-P001/032-09628 (=50µm). Fig. 12. Moskovistella khaini Afanasieva, FF-P001/041-04727 (=37µm). Fig. 13. Polyentactinia zhamoidai Afanasieva, FF-P001/011-04722 (=50µm). Fig. 14. Radiobisphaera menneri Afanasieva, FF-P001/014-04714 (=50µm). Fig. 15. Bientactinosphaera morozovi Afanasieva, FF-P001/116-09212 (=33µm). Fig. 16. Borisella bykovae Afanasieva, FF-P001/037-09537 (=50µm). Fig. 17. Spongentactinella olafi Afanasieva, FF-P001/056-04125 (=100µm). Fig. 18. Ornatoentactinia solita Afanasieva, FF-P001/043-13126 (=63µm). Fig. 19. Ceratoikiscum ukhtensis Afanasieva, FF-P001/106-09835 (=67µm). Fig. 20. Nazarovites bioculus Afanasieva, FF-P001/092-09834 (=56µm). Fig. 21-31. Lower Frasnian radiolarian complex with с Helenifore gogoense - Spongentactinia concinna. Western Australia, Canning Basin, Gogo Formatian (18º25.8’S, 125º54.3’E). Fig. 21. Paleotripus gogoense Aitchison, GSWA-F43981 (=86µm). Fig. 22. Ceratoikiscum echinatum Aitchison, GSWA-F44019 (=71µm). Fig. 23. Ceratoikiscum torale Aitchison, GSWA-F44022 (=100µm). Fig. 24. Ceratoikiscum spiculatum Aitchison, GSWA-F43991 (=115µm). Fig. 25. Palaeoscenidium venustum Aitchison, GSWA-F43965 (=58µm). Fig. 26. Helenifore gogoense Aitchison, GSWA-F44025 (=77µm). Fig. 27. Helioentactinia stellaepolus Aitchison, GSWA-F44081 (=71µm). Fig. 28. Secuicollacta araneam Aitchison, GSWA-F44079 (=48µm). Fig. 29. Entactinia proceraspina Aitchison, GSWA-F44069 (=150µm). Fig. 30. Entactinia hystricuosa Aitchison, GSWA-F44063 (=63µm). Fig. 31. Retisphaera concinna (Aitchison), GSWA-F44057 (=67µm).